The Olympic mountains create a dramatic rain shadow effect when storms and moisture arrive off the Pacific Ocean from the south and west, the prevailing storm track in the Pacific Northwest. When the moisture-laden air hits the Olympic Massif it is forced to rise. When the moist air rises, it expands and cools. The colder the air, the less able it is to hold moisture, so clouds and precipitation form. 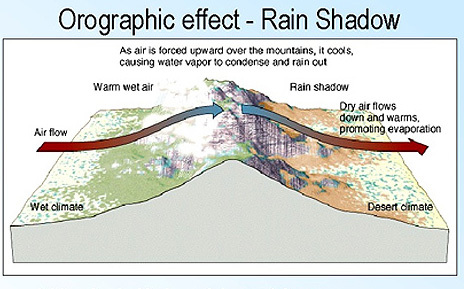 This effect is known as the orographic effect. The orographic effect in the Olympics results is copious quantities of clouds, rain or snow in the foothills and SW slopes, in places like Aberdeen, Forks, and Quinault. 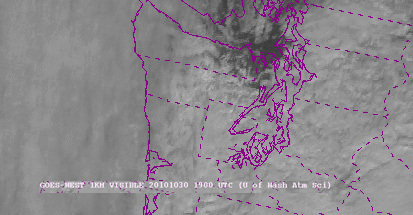 As the storms and moisture proceed over the crest of the Olympics, the air has lost much of its moisture. Furthermore, it descends, and warms, giving it more ability to hold moisture, preventing the formation of clouds, rain, fog, and resulting in a dryer, sunnier climate in places like Sequim, Port Townsend, and San Juan Island. The formation of a sunny, dryer area like this is know as the rain shadow effect. Hypothesis # 1. Dry summer months are the great equalizer: everywhere is sunny! While the Olympic Mountains are very cloudy and wet much of the year, they typically have a dry sunny period during the summer. During these periods, there is no rain shadow effect, and often the entire region is sunny! However, there may be a measurable impact due to fog, as all rain shadow areas are on the water, and have some fog. Hypothesis #2. Fast moving storms tend to form a better rain shadow than slower, stalling storms. We feel this is because without the progression over the Olympics, the dynamics that form the rain shadow effect are not present. The rain shadow forms particularly well on the back side of fast moving storms with defined cold fronts. So whenever you hear phrases like “fast moving cold front” in the forecast, it will likely be sunny in Sequim! Hypothesis #3. Very large, strong, and/or slower moving Pacific storms can sometimes fill in the rain shadow completely. This seems to be particularly true with warmer storms during the winter months. Hypothesis #4. Shoulder seasons are golden! Average or typical storms in the fall and especially spring, tend to form very nice rain shadows. These storms often to loose all their precipitation to the south and west, and sometimes just result in cloudy conditions in the rain shadow, followed by rapid clearing. One possible reason for this is that the increased solar radiation causes quicker clearing and drying. The October 2010 study supports this hypothesis, and we look forward to a closer examination of spring data. The following analysis and satellite photos from a fall storm system over the weekend of October 30 and 31, 2010 support this hypothesis. 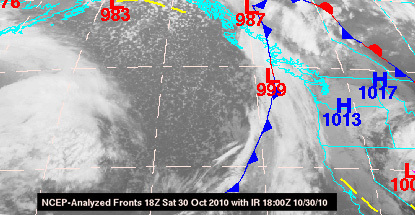 On Saturday October 30 a modest area of low pressure with an associated cold front approached the Washington coast. At 11:00 AM Saturday as the warm front approached, the rain shadow had clearly formed, and it was a beautiful sunny day in Sequim. On Sunday the 31st, the Saturday system had passed to the East and a bigger one was brewing off shore. 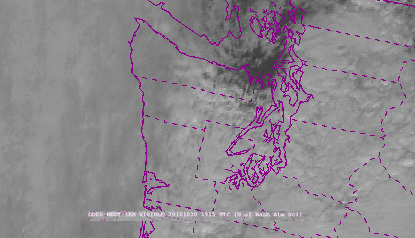 Again, a clear rain shadow had formed, with a nice sunny day in Sequim. These images clearly show that the rain shadow formed, and persisted through a moderate fall storm event. 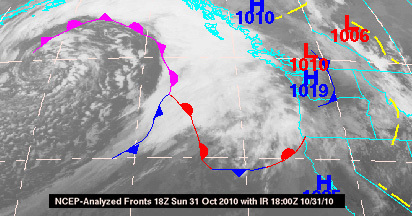 As mentioned, on Sunday the 31st, a larger storm was approaching the coast. This storm was a warm, intense storm drawing moisture from tropical latitudes. The computer modeled precipitation prediction (University of Washington) below clearly shows the formation of a rain shadow due to this storm on November 1st. We haven't yet analyzed the visible satellite and solar radiation data for November, but our hypothesis is while precipitation was light in the rain shadow area, from a sunshine perspective, this storm likely overwhelmed the rain shadow effect, and "filled in" the entire area with cloud cover.